1 - 6 1 /8 " Nozzle Dia. Efficient Heat Transfer is provided by high quality nickel chromium resistor wire wound on a select mica strip and enclosed in a die-formed aluminum coated steel sheath. Long-Term Durability is assured by non-hygroscopic mica insulation. Uniform Fit to ±1/16". 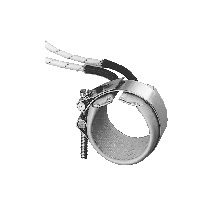 Type A Extra Flexible Stranded Nickel Leadwire protected by means of a close-knit stainless steel braided sleeve. Standard length is 24" with 18" of braid. Heavy Duty Stainless Steel Anti-Torque Post Terminals Standard is #10-32 threads, except for 1" wide units which have #6-32 threads. Reliable Performance and Quick Temperature Response One-Piece Construction provides maximum nozzle coverage in tight spaces. Barrel Dia. Heater Width Term. When using the "Part Number Builder" below, review part number table and spec sheet for best success.